The aircraft, a Beechjet 400A, collided with a snowplow while landing at the Telluride Regional Airport, Colorado, USA. The pilot, co-pilot, five passengers, and the snowplow operator were not injured and the airplane was substantially damaged during the accident. Instrument meteorological conditions prevailed at the time. The flight departed Monterrey, Mexico, with a planned stop in El Paso, Texas, en route to Telluride, Colorado. Prior to departure from Monterrey, the crew obtained preflight information, including NOTAMs for the planned route of flight. The NOTAMs for Telluride (KTEX) noted several runway closure times; however, none of the closures were valid for the period during which the flight would arrive at KTEX. The flight departed El Paso at 12:20 MST and the flight crew discussed the weather conditions at their destination airport, including concern that the weather maybe below minimums and may not allow for a landing. The Montrose Regional Airport (KMTJ), Colorado, was discussed as an alternate destination. As the flight neared their destination, the crew was in contact with a Denver en-route/center controller. The crew also listened to the Telluride's airport automated weather station. At 13:48, the controller asked the pilots to advise him when they had the weather and NOTAMS for KTEX, adding that another airplane just attempted an approach into KTEX, but had to execute a missed approach. The pilot reported that they received the weather information and planned to make the approach. The controller responded by giving the flight a heading, saying this would be for the descent and sequence into the airport. At 13:50, the airport operator entered a NOTAM via computer closing the runway (effective 13:50) for snow removal, and the airport operator proceeded onto the runway. At 13:58, the controller cleared the accident airplane for the approach to the airport. The pilot then cancelled his flight plan at 14:02 with the airport in sight. The crew did not change radio frequency to the airport's common traffic advisory frequency (CTAF) for traffic advisories. During the landing, the crew did not see the snowplow on the runway until it was too late to avoid a collision. PROBABLE CAUSE: "The limitations of the air traffic control equipment that prevented the controller's timely recognition of NOTAM information that was effective immediately and resulted in the issuance of an approach clearance to a closed runway. Also causal was the pilots' omission to monitor and transmit their intentions on the airport common frequency. 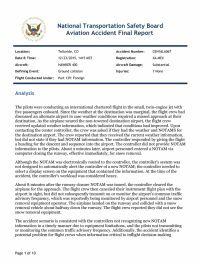 Contributing to the accident was the controller's heavy workload and the limitations of the NOTAM system to distribute information in a timely manner." Distance from El Paso International Airport, TX to Telluride Airport, CO as the crow flies is 693 km (433 miles).